Relaxation and conversation have never been as cozy as when you complete your living room setting with this lavish sectional sofa. The extra thick back and plush pillow arms will softly envelop you while you sink into the resilient comfort of the high density foam seat cushion. There's a middle console which has a lift top arm for small storage space and two cup holders for a safe spot to place drinks down while entertaining or busy doing the crossword puzzle in the morning. Featuring two arm seats and two arm-less seats with power reclining controls, you will have a hard time vacating the comfort of this sectional sofa on game-days, movie marathon nights, and even everyday use. The Latitudes - Delia Power Reclining Sectional Sofa with Armless Reclining Chairs by Flexsteel at AHFA in the area. Product availability may vary. Contact us for the most current availability on this product. 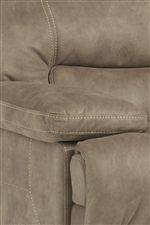 1458-59P Armless Recliner w/ power 2 32" 40" 38"